Paul walked to the NYC library to meet my bus with me. We walked out the hotel around 5:20 am. It was only a few blocks away. I layered my racing gear with a sweatshirt and pants to discard before the race (they take all discarded clothing to charities). On the bus ride I sat next to a very nice Brazilian who was running her first marathon. She had a terrible cold, poor thing, so I hope she did okay. The bus ride took forever and there was a big bus traffic jam once we got to Staten Island. However, I did not mind one bit - because I knew once I got off the bus it would be hanging out in the cold (37* and windy) for hours. Once we got off, I headed to my designated hang-out section. 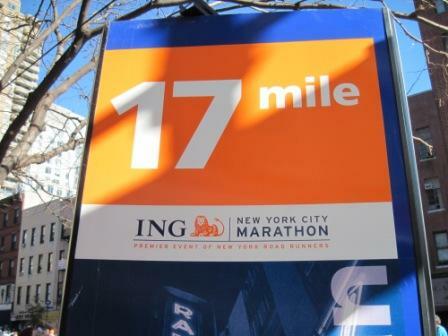 There are a lot of logistics that go into running the NYC marathon, but I have to say it is so organized and informative that you're going to have a good experience. At my hang out section they had Duncan Doughnuts coffee, hot tea, water, Gatorade, Powerbars, and bagels. I grabbed a bagel and a free fleece hat from Duncan Doughnuts (I don't drink coffee). Then I asked this girl for the time (I don't race with a watch). Turns out she was a kindred soul from Michigan. She was the same age as me, with 2 children at home, running NYC for the first time as well. So we found a spot in the sun and sat and gabbed to pass the time. Thanks, Sara(h), for making the morning so much more enjoyable! I confess I was freezing. I shivered the whole time. At one point a random guy gave me an extra pair of pants because I was shivering so badly. Many people brought sleeping bags or snuggies and I was way jealous of their genius planning. My wave started last, at 10:40 am. I ate a Powerbar just before starting. The energy at the start was awesome. I was more nervous about this race than I have been of any of my previous marathons (this was #8 for me). The National Anthem was sung by an opera singer. Then a gun went off and they started playing New York, New York. Everyone started singing the song as we started running. The bridge was cold and windy, but everyone was so excited. I took the first few miles a little fast. I was mostly just trying to get warm, having shed my layers. After the bridge I ran into Brooklyn. The crowd support was amazing. I gave so many high 5s to kids spectating along the side of the course. Along the way, I counted bands I saw in my head. Lots of music, and I just can't say enough about the energetic vibes coming from the crowds. I felt good and my foot was hanging in there. Because the start time was later in the day, I got hungry earlier in the race than expected, around mile 6 (I typically don't start taking fuel until after mile 10). I had planned for this, though, and brought some Gatorade chewies to tide me over until I started taking Gus. Brooklyn felt like the longest stretch of the course (although I don't know if that is true). The miles were flying by though. The crowds just made them pass so quickly. And I was finally warm and settling into a good pace. 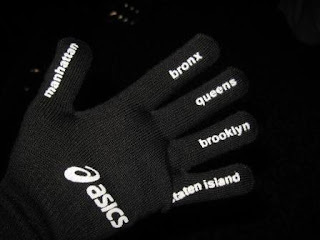 After Brooklyn the race goes into Queens. I continued to count off bands in my head. Queens was fairly short, and involved a long bridge. On the bridge, I started feeling my foot, but I had planned for that too. I took a couple of ibuprofin at that point to do damage control. Paul was waiting for me around mile 17. I was surprised to see him, as we hadn't planned for it. Apparently I was easy to spot in my Virginia shirt and hot pink Duncan Doughnuts hat. 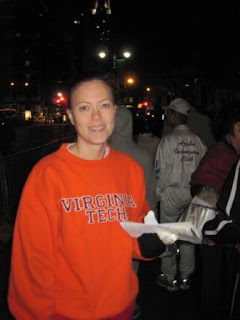 The Virginia shirt was fun, because people yelled it out to cheer me on the whole race. A couple miles later the race got into Harlem. Which was one of my favorite parts of the race. The crowds there had soul. Tons of music, the crowds dancing and jumping and getting down. It was one huge party there. Then into the Bronx for a short mile or so before heading back into Manhatten, for the last 5 miles. I still felt fairly strong, but things got a little crowded on the course here. Mostly, because people were tired, so many were trudging or you'd be running behind someone and they'd stop suddenly to walk. I made a quick pit stop at mile 21 and then tried to settle back on pace, but I just couldn't because of the crowds. I was having to bob and weave around walkers everywhere. But it was all good - I knew that I was on the home stretch, and was going to finish strong. 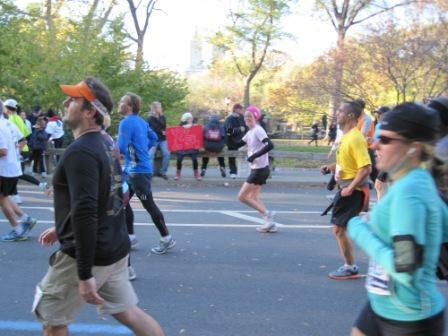 Just before mile 23 I entered the rolling hills of Central Park. Finish time was right at 4:20. Not a PR, but I'm thrilled with my time and ran stronger than I expected. Once I finished and got my medal, there was a long, slow shuffle through Central Park to the exit. This process actually takes about an hour. And brrrr, was it cold! Nah...I don't look cold at all, do I? Hmmm. I can't decide which is worse. 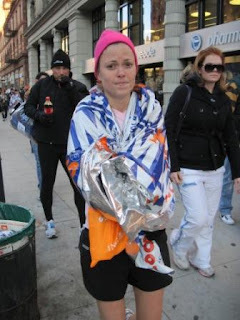 Post-birth pictures or post-marathon pictures? So thankful I finished and had such a great time. What an awesome city. Thanks to all of you for the support! Hooray! We heard a report on the race on the radio last night. I told JDaniel that mommy had a friend running in the race. I was praying during the morning that things would go well. You're awesome! I can barely run a 10K...congrats! Congratulations from a fellow MomLooper! It looks frigid out. Woo hoo! Great race report! Congrats on your race! Congrats to you. Man I am so proud of you and I don't really know you - I do know some of what you went through - great job. Thanks for sharing and giving me a totally new perspective of NYC through a marathon runner's eyes. I've only ever been in the crowds, and wow, to think of the effect they have, it just gave me chills. Oh, woman, you've never had Dunkin Donuts before? You're totally missing out. Too bad they didn't have tea there for you. ALthough you mightn't have wanted the caffeine anyway. As I've said already, I'm SO proud of you! You kicked MEGA-@$$!!! :) [Sorry to anyone who is offended, but this native NYer is loud and proud of my bloggy friend!] Congrats, again!!! Oh Wow! I'm proud of you too! I did watch most of the marathon on tv. I looked for you but knew I wouldn't know for sure if I'd seen you or not but it was fun watching the marathon just because I knew one of my blogging buddies was running in it. Otherwise I probably wouldn't had watched it. I could tell that it was cold! I didn't realize that it was such a long wait and things of that nature for the runners. Thanks for taking us on your adventure with you! I'm not a runner and never have been but I was cheering you on girl! Great Job! Glad you got to go and do it and had a great time! Thanks for sharing your run with us! Glad you had such a good running time too! Hope you got warmed up quickly after getting everything done too. I have goosebumps. I was feeling like I was there while you were describing it all. What an awesome experience, I am so glad you had a wonderful time & that your foot didn't give you too much trouble. Oh & for the record you looked pretty darn great post-marathon! Congrats!!! So awesome for you! So cool to read about people's race experiences.